Book are always welcome presents at Christmas time. But one book that arrived in the post last week was not so much a present but the arrival of a copy of a book that I had contributed to but had sadly missed its launch in Maynooth earlier this month. 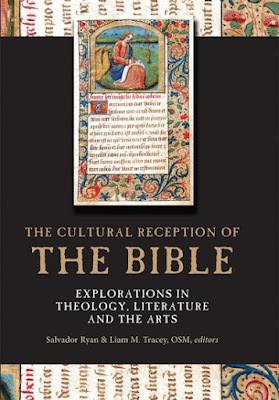 I am one of the many contributors to The Cultural Reception of the Bible: Explorations in Theology, Literature and the Arts, published by Four Courts Press. This new book is edited by Dr Salvador Ryan, Professor of Ecclesiastical History in Maynooth, and Dr Liam Tracey, Professor of Liturgy in Maynooth and was launched three weeks ago (5 December 2018) in the Pugin Hall in Maynooth. This new a festschrift in honour of Professor Brendan McConvery, who was my lecturer in Biblical studies over 30 years ago, and I have worked with him again in recent years in his capacity as editor of the Redemptorist publication Reality. My chapter is also illustrated with a number of photographs, including one of Hort from his son’s biography, and my photographs of Leopardstown House in Dublin, which was his childhood home, Emmanuel College, Cambridge, where he accepted a fellowship in 1822, the former Cambridge Divinity School, where Hort had rooms from 1879, and some of his many books. The other contributors to this book are: Cardinal Joseph W. Tobin, CSsR (Newark); Thomas O’Loughlin (University of Nottingham); Cornelius Casey, CSsR (Trinity College Dblib); Jeremy Corley (Saint Patrick’s College, Maynooth); Noel O’Sullivan (SPCM); Michael A Conway (SPCM); Jessie Rogers (SPCM); Martin O’Kane (University Wales, Trinity Saint David’s); Kerry Houston (Dublin Institute of Technology); Michael O’Dwyer (Maynooth University); Brian Cosgrove (Maynooth); Diane Corkery (University of Strathclyde); Raphael Gallagher, CSsR (Alphonsianum, Rome); Terence Kennedy, CSsR (Alphonsianum, Rome); Padraig Corkery (Maynooth); Carol Dempsey, OP (University of Portland, Oregon); Thomas R Whelan, CSSp (National Centre for Liturgy, Maynooth); Liam Tracey, OSM (Maynooth); Penelope Woods (Maynooth); Ruth Whelan (Maynooth); Elochukwu Uzukwu, CSSp (Duquesne University); Hugh Connolly (Centre Culturel Irlandais, Paris); John-Paul Sheridan (Maynooth); Helen Cashell-Moran (TCD); Katherine Meyer (TCD); Seamus O’Connell (Maynooth); Jonathan Kearney (DCU); Patrick Comerford (CITI/TCD); Martin Henry (Maynooth); Paul Clogher (Waterford Institute of Technology); and the port John F Deane. Christmas continues … today is the Third Day of Christmas. But, instead of expecting ‘three French hens,’ today is the Feast of Saint John the Evangelist [27 December 2018]. Throughout the season of Advent this year, I spent a short time of prayer and reflection each morning, using the prayer diary of the Anglican mission agency, USPG (United Society Partners in the Gospel), and the Advent and Christmas Devotional Calendar for 2018 being used in Lichfield Cathedral. I am continuing this practice for these few days. Give thanks for the pioneering work of Christians who offer themselves in service as the hands and feet of Christ. Today’s suggested reading is John 21: 19b-25. God works through his faithful servants. Ask God to give you a definite task to do in his service.